Astronomers have uncovered a near-record breaking supermassive black hole, weighing 17 billion suns, in an unlikely place: in the center of a galaxy in a sparsely populated area of the universe. The observations, made by NASA’s Hubble Space Telescope and the Gemini Telescope in Hawaii, may indicate that these monster objects may be more common than once thought. Until now, the biggest supermassive black holes – those roughly 10 billion times the mass of our sun – have been found at the cores of very large galaxies in regions of the universe packed with other large galaxies. In fact, the current record holder tips the scale at 21 billion suns and resides in the crowded Coma galaxy cluster that consists of over 1,000 galaxies. One idea to explain the black hole’s monster size is that it merged with another black hole long ago when galaxy interactions were more frequent. When two galaxies merge, their central black holes settle into the core of the new galaxy and orbit each other. Stars falling near the binary black hole, depending on their speed and trajectory, can actually rob momentum from the whirling pair and pick up enough velocity to escape from the galaxy’s core. This gravitational interaction causes the black holes to slowly move closer together, eventually merging to form an even larger black hole. 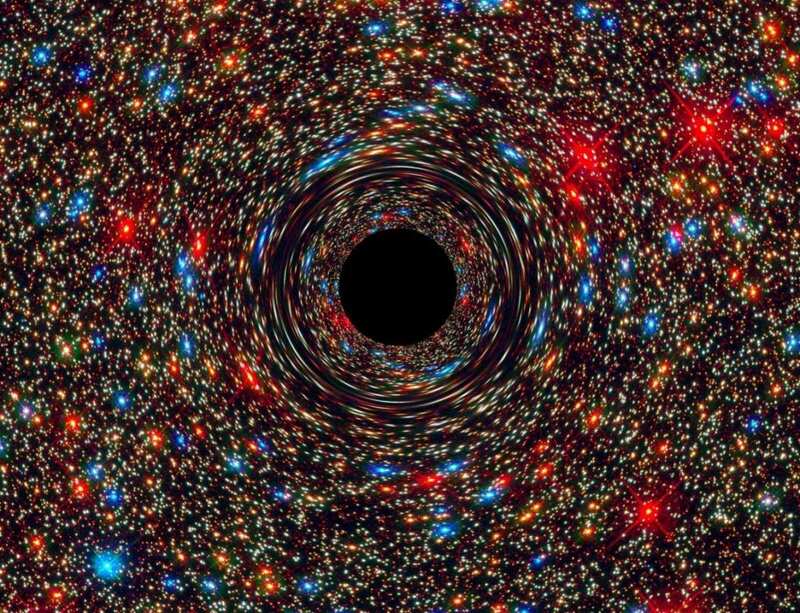 The supermassive black hole then continues to grow by gobbling up gas funneled to the core by galaxy collisions. “To become this massive, the black hole would have had a very voracious phase during which it devoured lots of gas,” Ma said. Archival Hubble images, taken by the Near Infrared Camera and Multi-Object Spectrometer (NICMOS), supports the idea of twin black holes pushing stars away. The NICMOS images revealed that the galaxy’s core was unusually faint, indicating a lack of stars close to the galactic center. A star-depleted core distinguishes massive galaxies from standard elliptical galaxies, which are much brighter in their centers. Ma and her colleagues estimated that the amount of stars tossed out of the central region equals 40 billion suns, comparable to ejecting the entire disk of our Milky Way galaxy.